Fitting Products including Fix ALL range of silicones - DGS Group Plc. PVCu Fascias, PVCu soffits, PVCu cladding, window trims and window cills means installers can now offer everything they need for a quality installation. 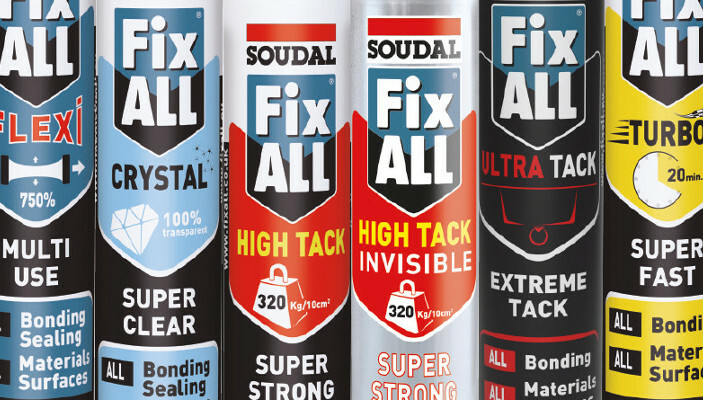 Soudal’s range includes core products such as the Fix ALL range of silicones, superglues, cleaners and foams. Look out for the Soudal logo throughout this section. Brett Martin’s Rainwater systems, fully tested for accelerated ageing in accordance with BS EN 607:2004 and loading capabilities have been tested to BS EN 1462:2004. Used for protection and support, flat glass packers, bridge and frame packers, locking and handle wedges. Drain hole covers and wedge and repair gaskets. A selection of glass cleaners, cream and solvent cleaners, wipes and sprays. Designed for use on most types of glass, mirror, plastic and hard surfaces such as chrome and laminates. Ideal for use in the double glazing industry. SGT super double sided security tape, tape applicators, trim mounting tape, protection tape and masking tape. For strong adhesion of sealed units or for decorating & surface protection purposes. A selection of fitting tools including, moon knife, gasket shears, tape measure, stanley scraper, stanley knife/blades, razor blades, skeleton gun, foam gun, chisel knife, colour edging pens and window frame snapper. The market leading brand, Rapierstar CE Marked screws offer superior performance and the best value for money window screw range as well as a cost effective guarantee of corrosion resistance.